This is the new BMW 2 Series Convertible which is the third model in the line-up for the 2 Series and is the replacement for its popular 1 Series Convertible. Indeed, the car it replaces is the bestselling car in its class having notched up 130,000 sales around the world. Buyers can choose from four engines, including a new 2.0litre diesel unit, it’s a first for convertible with a BMW badge, there’s also an M variant on offer in the M235i. 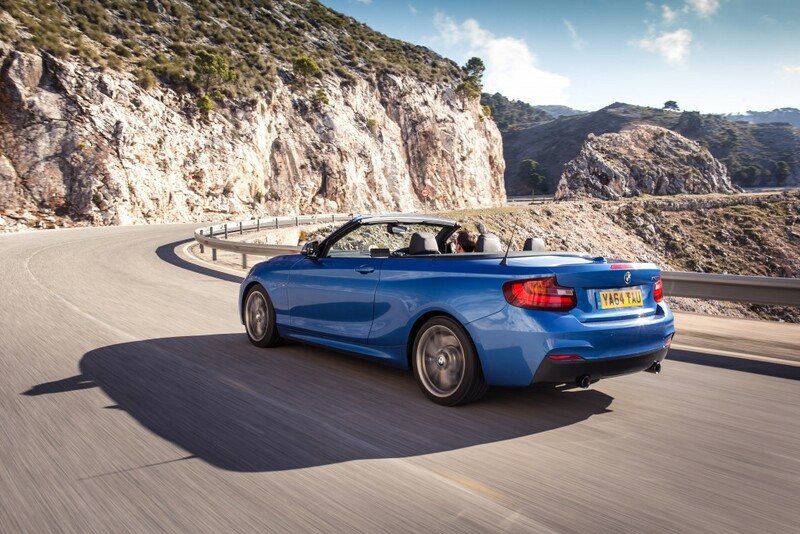 The BMW 2 Series Convertible is an all-round impressive car and its fuel economy is being boosted by nearly 20% and there’s more space and equipment on board and it handles better too. Performance is as you would expect; the entry-level BMW 2 Series Convertible 220i Sport will go from 0 to 62 mph in 7.5 seconds and has a top speed of 145 mph (though it will be limited to 140mph). Fuel economy is also quite impressive and most owners will return around 41mpg on the combined cycle and CO2 emissions are 159g/km. The OTR for this vehicle is £29,180 while the most expensive model in the range is the BMW M235i which costs £37,710. This latter 2 Series convertible with go from 0 to 62 mph in 5.2 seconds with fuel economy of 33mpg. However its CO2 emissions are 199g/km. The speed for the BMW M235i Convertible, which has a 3.0litre six cylinder engine under the bonnet, is limited to 155 mph. Just like other carmakers, the BMW 2 Series Convertible is longer and wider than the car it replaces and this creates more space on board. Driver enjoyment is also excellent when the roof is down. BMW says the roof will fold down in just 20 seconds to fit snugly in the boot and it can be done at speeds of just over 30 mph. The boot itself has also been made larger by 30litres and now measures 335litres, which is the largest in its segment. It’s fairly obvious that this is a BMW, the stretched silhouette has all of the firm’s design characteristics from the long bonnet and short overhang. The interior is well designed with all of the instrumentation close to hand and clear. The designers have worked well to create a driver-focused environment and the car has a premium quality feel to every aspect. The BMW 2 Series Convertible also has a 6.5 inch display screen from which the driver can control all of the systems. Equipment on the new car is quite impressive, particularly on the safety front with plenty of airbags and a tyre pressure monitoring system. This entry was posted in Car Leasing, Car Updates & Releases, Cars, Family Car, New Cars and tagged BMW 2 Series, BMW 2 Series Convertible by Steve Lumley. Bookmark the permalink.